Information about the success of your website is critical. Website although once thought as being static brochures for the world to see are now changing every week. Google itself is constantly measuring the value (relevancy) of your website for the search results it provides so its now more important than ever to know your number of visitors, bounce rate, time spent on site, and number of pages visited. The best source of this information is via a Google Analytics account which you can set up for free. When the service is setup, code can easily be placed into your website CMS. Statistics about the results of your newsletter is also important in helping guide your business in the right direction in the services you supply and what information you share with them and with the Create-Send email newsletter service detailed statistics are available. You can see statistics about each person that clicked on a link, removed themselves from your list or even just looked at the email message. Maintaining your ranking for selected keywords and phrases is an ongoing task that depends on how often and how well you get your message (and those keywords) out there onto the Internet. As part of our Content Marketing Setup we’ll list all of the keywords that are important to your business, noting that they may change from time to time and keep track of your success with these words and phrases. Our content marketing professionals have tools to monitor your rankings for selected keywords as often as they need to, often daily, and can report back about your progress. We provide this service as part of our Content Writing and Optimising tasks. 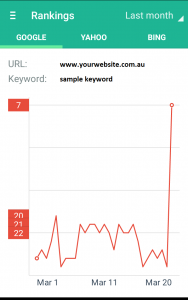 Not only will we provide you with keyword rankings but can report on your overall keyword progress during your campaign. 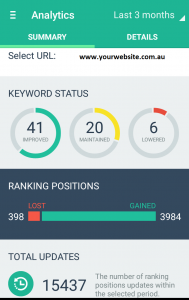 You may be the winner for all of your chosen keywords, and you can see your overall progress and use our analytics information to measure your success as well as make decisions for your future strategy.